Our handsome boy Mason is the resident clown here at Luchan Goldens but don’t let that fool you! He is a serious duck hunter and loves every opportunity to take part in Hunt Test events. He is a very smart boy and learns quickly…whatever the task may be! 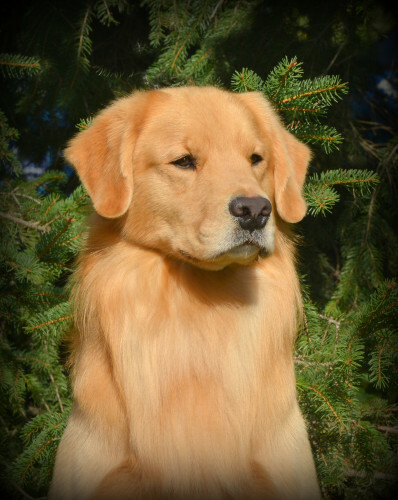 He was obtained from Gord Kerr at Prettyriver Goldens as a sweet little bundle of fur and has since taken us on a ride of a lifetime as we ventured into the world of Goldens! 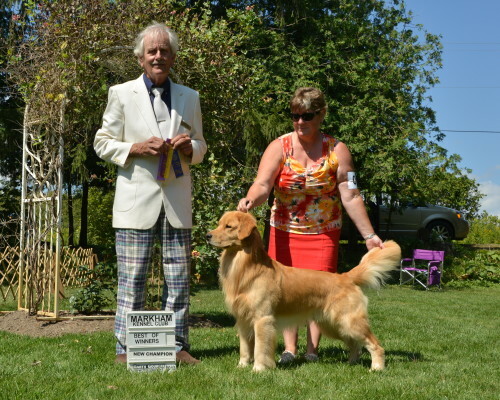 He obtained his Championship (Ch), Rally Novice (RN), Working Certificate (WC), Temperament Test (TT), Canine Good Neighbour (CGN), and American Certificate of Conformation Assessment (CCA) Titles all by the age of 2 and continues to chase ducks at every opportunity! We love our goofy Moo-man!